Wondering whether studying with Integrative Nutrition is for you? Well maybe I can help! I thought doing an honest review about it and hope that telling you my experience would be helpful for anyone out there sitting on the fence :) Here are some frequently asked questions! What is The Institute for Integrative Nutrition? The Institute for Integrative Nutrition (IIN) is a holistic nutrition program. It started in 1992 as a small classroom of students and has grown to have over 50,000 grads worldwide. It’s a balance of nutrition/wellness/lifestyle classes as well as business classes on how to start a business as a Health Coach, begin a career in the wellness world, or incorporate health coaching into your current career/lifestyle. Is the whole course online? Can I do it from anywhere in the world? Yes! This is what I loved about it as I started the course whilst I was working as International Cabin Crew with Emirates so I wanted something super flexible. It was so great to be able to log in at any time during the week and complete the requirements. How long does it take and is there an option for further learning? The course is one year. There is no further options to study past this with IIN but it really helps clarify what you might like to specialise in so you can then go and hunt out the most suitable place to learn more about that. How many hours per week do you need to dedicate to it? I would say a minimum 4 - 5 hours depending on how in depth you want to get with the course content. I worked full time and managed completely fine! You can also download mp3 versions of the course so you can listen to it whilst going for a walk or even on the commute to work in the morning! I paid around $4,500.00 for the full course when I signed up in 2013 but I can definitely help you to get a sweet discount! Email me directly and I will hook you up or follow this link to get a course rundown and go from there :) You are not obliged to sign up but it's great to just get some more information to help you make up your mind. They also offer payment plans to make it more achievable for everyone. Why can you get me a discount? I have tuition discounts available because I am part of their ambassador program which is for dedicated students who genuinely love to spread the good vibes of the course and really believe in how it could positively impact your life (and all those who surround you!). How much money can you make as a Health Coach? It's up to you! A lot of people study IIN not even intending to start their own business but just to get a comprehensive, non bias, all round view of health and wellness to benefit their own lives and their families. Those who are seriously dedicated to becoming a health coach can easily charge $75 - $100 an hour for a session or even dream big and create your own online program, write a book, run workshops etc where your earning potential is limitless. It's all about where you see yourself going and where your passion lies. It's a self made career though so you have to be prepared to hustle and really dedicate yourself to building a strong brand! Why did you choose IIN over other Health Coaching programs? I actually started an Advanced Diploma in Nutritional Medicine through private college in Sydney and after a year I realised I wanted to be studying something that was more holistic and incorporated a varied belief system on how to achieve good health - aka it's not all in the food! IIN teaches you about bio-individuality which is what works for one person, may not work for another so it's about treating the individual not just a textbook version on a human! It's also just a great foundation for nutrition regardless and I would highly recommend anyone looking to go into full blown nutrition/dietetics to study this course first to get a taste test without the 5 year commitment! What are the biggest benefits you received as a result of IIN? The course is seriously wonderful because it opens your eyes to so many different theories but something extra special is the sense of community it also brings into your life. It feels like everyone is there to support you and build you up! There is also a fantastic business building part of the course to help you graduate already set up with a business structure and marketing plan which I think is super unique and beneficial. You aren't just left on your own with knowledge but no business sense! I love this course so much so that my sister and best friends also did it after me but of course, like anything there are some things you need to remember! You have to be self motivated when it comes to studying and making time to learn as there is no teacher pushing you to complete the work. It's entirely up to you so just note that when going in to it and plan out your time so you finish the work. 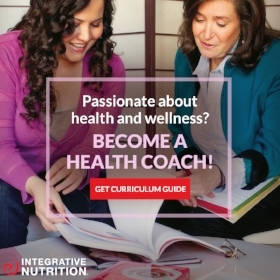 Once you have completed the course you will be a Certified Health Coach which isn't the same as a Nutritionist or Dietician - these require university degrees that can be upwards of 4 years. I think it's a great introduction into the wellness industry and if you find you are deeply passionate about going down a more medicalised stream then further study is required. This course isn't just for those who want to become a health coach, it's for all the people out there who are confused about all the information out there and tired of putting their health in the hands of others. I found it really empowering to learn how there are so many different ways of healing and, just like each of our bodies and experiences are different, our healing journeys will be different too. It brought a lot of clarity into my life about the kind of business I want to build and my view on the whole health industry. I really hope this might of helped you a little bit! I think everything is worth a try so I encourage you to just find out more by either contacting me or clicking on the picture below :) No harm in learning more!